With these four fresh takes on tamales, it&apos;s what&apos;s on the inside that counts. New Mexicans have many ways to enjoy the holidays through our unique food and drink. One of our gifts to you this holiday season is a recipe for making an adobe gingerbread house from our December, 2008 edition. View and print it here. During the holiday season, many New Mexican families gather for a tamalada (a tamale-making party). 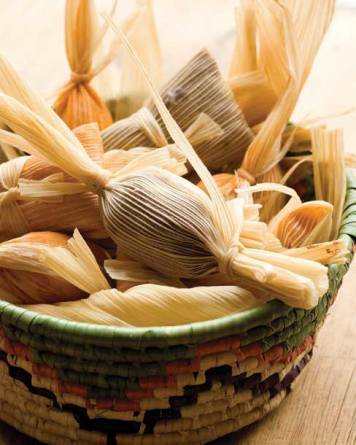 Because tamales can be quite labor-intensive to make, families create assembly lines with each member taking on a role—putting on the masa (a mixture of ground corn and a binding ingredient like lard), layering the filling, and tying the cornhusks. Tamale-making has been a tradition for thousands of years—there is evidence that Mesoamerican peoples made tamales in what is today Honduras as far back as 10,000 years ago. Here in the Southwest, maize (corn) has been integral to the culture since ancient peoples began farming it sometime around 1250 b.c. 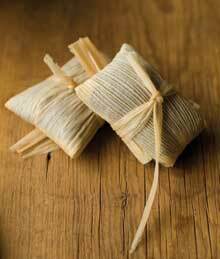 These pre-Colombian tamales, however, looked different from the varieties familiar to us today—like that of pork and red chile. Ancestral Puebloans didn’t raise pigs, and therefore had no pork or lard. So, tamales don’t necessarily require pork. In fact, tamales are much like sandwiches: You can fill them with just about anything. The configuration is limited only by your imagination. Just ask one of Santa Fe’s most famous tamale-making families. Aurora Lujan began selling her tamales informally in the City Different in the 1950s. Her family made things official when they opened Posa’s El Merendero more than 30 years ago, supplying their original tamales to restaurants and markets. Today, Lujan’s grandson Jeff Posa is president of the homegrown company, which makes more than 400,000 tamales each year. Although the family still creates traditional red-chile-and-pork tamales, they have branched out to create green-chile chicken, green-chile cheese, and vegan (with zucchini, squash, red pepper, green chile, and corn) variations. Here are four fresh takes on tamales for you to create this holiday season.And if all else fails, you can order tamales from Posa’s and have them shipped directly to you. Rocky Durham is a native Santa Fean, an educator, and a lifelong culinary professional. See more of Douglas Merriam’s work at www.douglasmerriam.com. 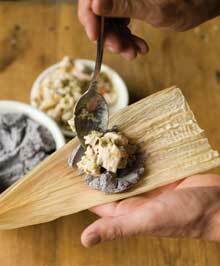 These tamales branch out from tradition by incorporating blue corn. For the masa: In a large bowl, combine blue cornmeal and masa harina. Pour in hot chicken stock and combine well with a rubber spatula. Cover and let stand for 30 minutes. Add remaining ingredients; mix until thoroughly combined. Adjust consistency with warm water until light, sticky dough is achieved. Cover and reserve. For the Filling: Carefully remove all the meat and skin from the bones. Slice the skin into thin pieces. Shred the meat and combine with the skin. Add remaining ingredients and mix together. Cover and refrigerate until needed. For the pesto: Combine all ingredients in a food processor. Pulse until combined. Adjust seasonings. Cover and refrigerate until needed. 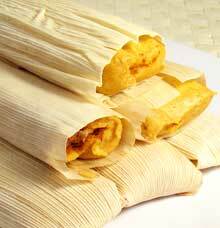 With a shrimp filling, these tamales are a light alternative to traditional pork tamales. For the masa: Combine masa harina, chicken stock, and tomato juice in a large bowl and mix well. Cover with plastic wrap and let sit for 30 minutes. Mix in fat (lard, vegetable shortening, or butter); blend until smooth. Add salt and oregano. Add warm water until light, sticky dough is achieved. Cover and reserve. For the shrimp filling: Combine all ingredients in a large, non-reactive bowl (like Pyrex) and refrigerate for 2 to 3 hours. Follow the assembly instructions (throughout) and cooking instructions provided in the Blue-Corn Green-Chile Chicken Tamales recipe. Salsa Veracruzana should be served alongside or on top of the tamales. For the salsa: Place a large sauté pan over high heat and add oil. Add onions and sauté for 3 to 4 minutes, stirring occasionally. Add garlic and sauté for another minute. Add tomatoes, olives, capers, and jalapeños; simmer for 3 to 4 minutes. Add cilantro, adjust seasonings with salt and pepper and reserve. If you’re looking for a healthy, vegetarian tamale recipe, this one fits the bill. For the masa: Place masa harina in a large bowl. Combine water, spinach, onions, and espazote in a blender; purée for 1 minute. Add this blend, baking powder, and salt to masa harina. Combine well. Add fat and combine well. Add warm water until light, sticky dough is achieved. Cover and reserve. For the filling: Place ingredients in a large bowl and mix until combined. Place mixture in a pastry bag with a large, round tip. Line a baking sheet with plastic wrap or parchment paper. Pipe cheese mixture onto the lined baking sheet and freeze mixture for 1 to 2 hours. Remove cheese from freezer and cut into 1½-inch pieces. Place pieces in a plastic bag and store in freezer until needed. Follow the assembly instructions (throughout) and cooking instructions provided in the Blue-Corn Green-Chile Chicken Tamales recipe. These dessert tamales will provide a sweet finish to any holiday meal. For the filling: Place all ingredients in a large bowl and combine with a rubber spatula until even. Cover and refrigerate for 1 hour. For the butter: Place all ingredients in a food processor and pulse to combine. Spoon butter out onto a sheet of plastic wrap and roll into a tight log. Refrigerate for at least 1 hour or until needed.